Get Bewitched by Halloween’s Spooky Charm! 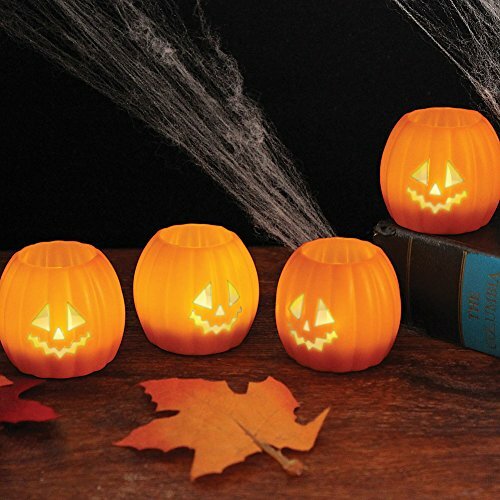 Are your porches and courtyards all adorned with pumpkins, lanterns, tea lights etched with spooky images, and all the other Halloween decor and trimmings? What about costumes and treats? 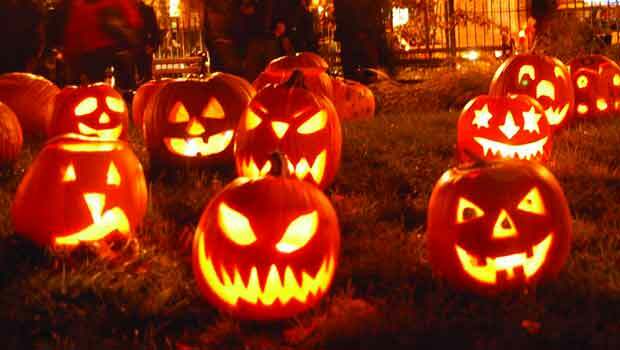 With another Halloween coming fast on our heels, let’s look at some fun and historical facts about this bewitching holiday in all its spooky charm. As harvest season ended, the Celts dreaded the coming cold weather. They believed that on October 31st—their New Year’s Eve—ghosts returned to earth and their presence enlightened the Druids to predict the future. To appease their deities, they burned crops and livestock, creating bonfires, as sacrifice. When Europe was Christianized, the Celts did not really give up the celebration of their Samhain. Instead, the harvest festival was altered and called All Hallows Eve—a special time to pray for the souls of the newly deceased to ensure their safe passage to heaven. 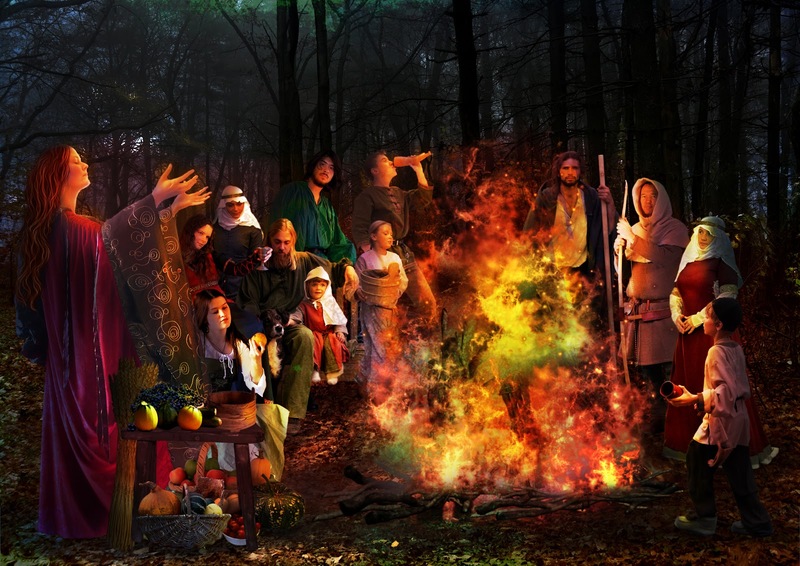 This tableau depicts the ancient Celtic festival of Samhain, which evolved into Halloween. 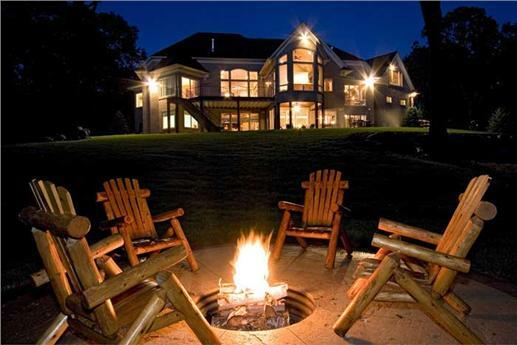 The fire pit on the grounds of this one-story, five-bedroom country home (left) is a perfect spot for a bonfire and scary story-telling on Halloween night (Plan # 165-1077). Add some jack-o’-lanterns (right) for effect. 2. The fanciful costumes and masks worn on Halloween arose from superstitions and the fear of ghosts, who were said to roam the earth on October 31st. When people left their homes on Halloween night, they wore masks to protect themselves and confuse hostile spirits into thinking that they were ghosts, too. 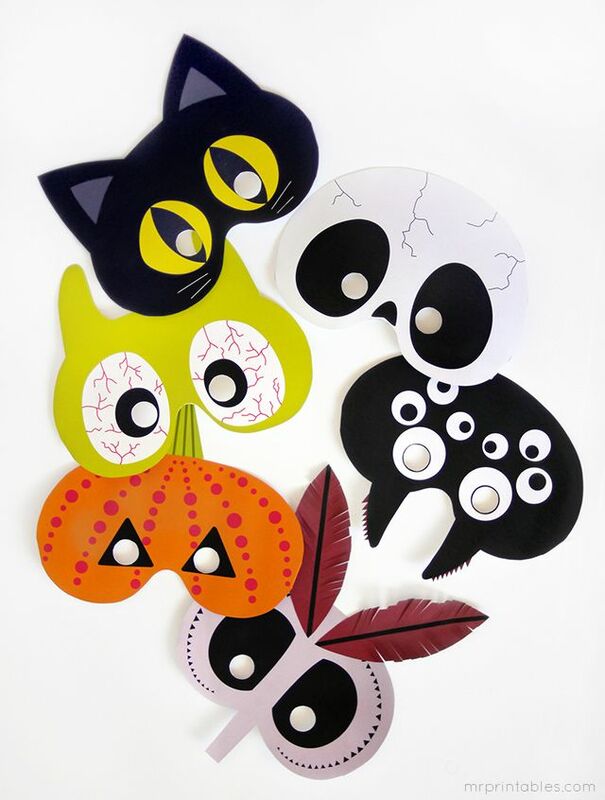 Festival masks (left) can be worn on Halloween as well to give the holiday both a whimsical and eerie feel. 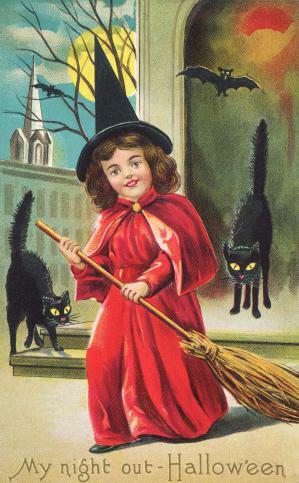 A witch’s costume is one of the more popular ones at Halloween. Illustrated in the center is a typical—but friendly-looking—witch. 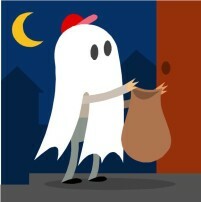 Wear a ghost costume on Halloween, and drive evil spirits away, according to ancient Celts. 3. On Halloween night, the Celts left food and treats outside their homes and along pathways to ward off unfriendly spirits. They set places at the table for their loved ones and lit candles to guide the departed back to the other world. A wonderful two-story Colonial style home (left) provides lots of ideas and spaces for Halloween touches (Plan # 106-1174) … for example, you can give the stairs a Halloween feel with a few jack-o’-lanterns. 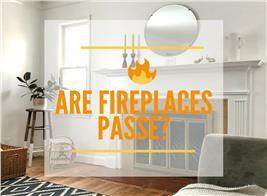 Since the home itself has a lot of atmosphere, don’t overdo it. 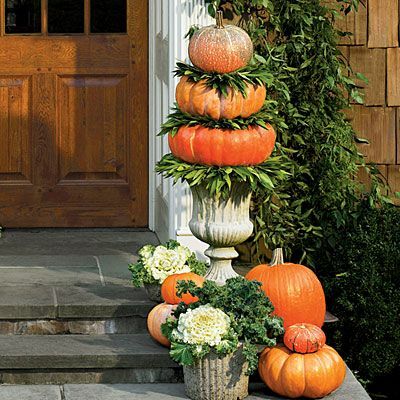 How about decking out the porch and front door with a wreath and other fall offerings (left). Or, as in the photo on the right, you can leave “food and treats for the spirits” (squash, pumpkins). 4. Bobbing for apples came from a festival that combined Samhain with one honoring Pomona, goddess of fruits, trees and fertility. Pomona’s symbol is the apple—and when cut in half, its seeds form a pentagram, a Celtic fertility sign. Believing the apple could predict future marriages, they gathered young people from nearby villages during the festival to bob for apples floating on water or hanging from a string. It was thought that the first person to bite into an apple would be the next to marry. 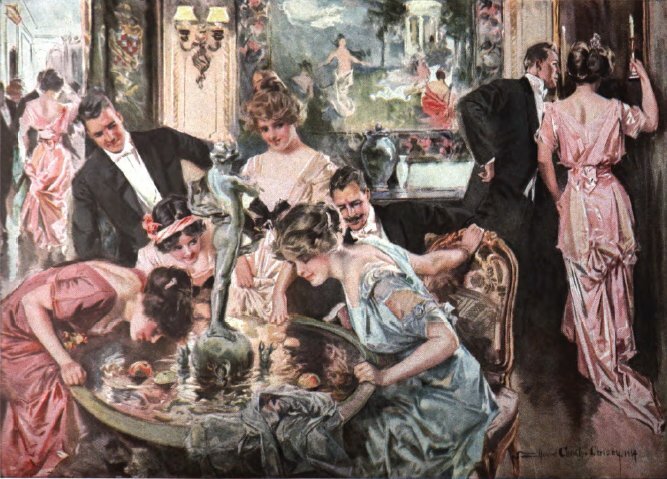 American artist and illustrator Howard Chandler Christy depicted bobbing for apples in his famous Halloween painting (left). A group of kids tries to bite apples hanging on strings. 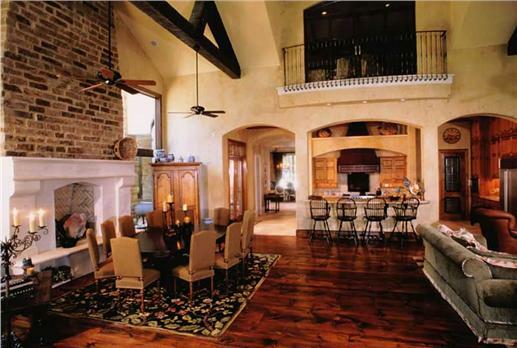 A costume party and “bobbing for apples” activity for adults on Halloween night—like the one in the painting above—can be staged in the Great Room of this two-story, six-bedroom French country style home at left (Plan # 134-1327). 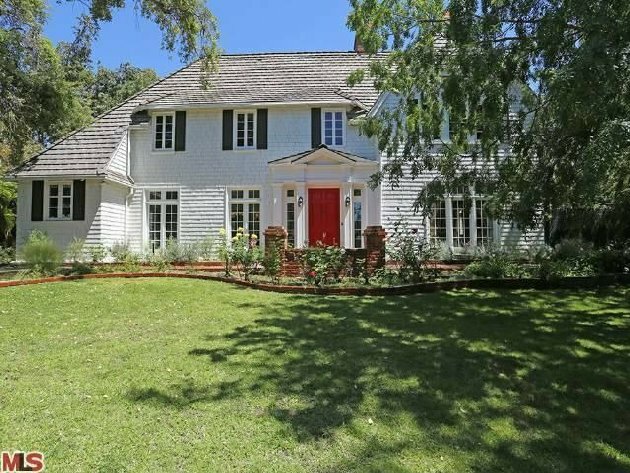 How about an outdoor “bobbing for apples” for kids in the courtyard of this gorgeous Arts and Crafts style house (right), with its many trees (Plan #115-1000)? 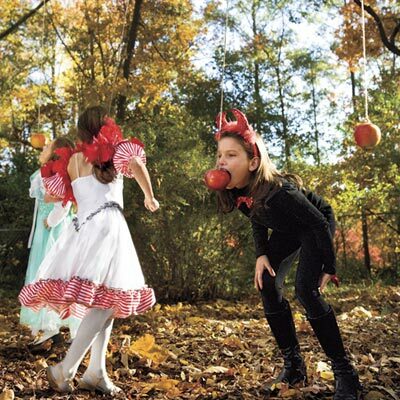 Be sure the apples are strung low enough for the children to reach and have great Halloween fun with! 5. 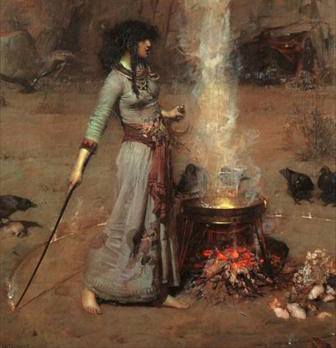 Did you know that the word witch is from the Old English “wicca”—a wise woman who sold medicinal herbs and charms in her community? A “wicca” or witch (left) reads her books of plants and herbs. She is portrayed as she was originally thought of in olden times—that of a wise and helpful person. 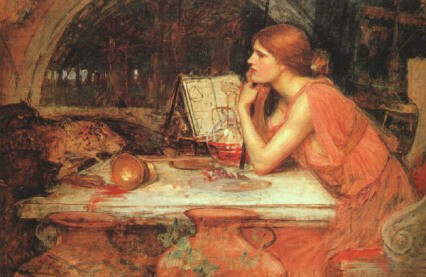 On the right is a reproduction of the painting The Magic Circle by the modern Pre-Raphaelite painter John William Waterhouse. In the picture, a good witch is about to use her wand to draw a circle that evil magic could not penetrate. 6. Long before trick-or-treat, there was a tradition called “guising” in England, Ireland, and Scotland, in which children disguised in costumes visited homes in their villages … and were given cakes, fruit, and money. The custom called “guising” started in Scotland, Ireland, and England in 1895 when children would disguise themselves and go from home to home with their lanterns caarved out of turnips. 7. 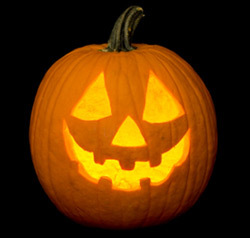 The jack-o’-lantern evolved from lamps carved out of turnips or squashes as part of the ancient harvest festivals. These lanterns were used by guisers to light their way as they traveled around their villages on Halloween night. 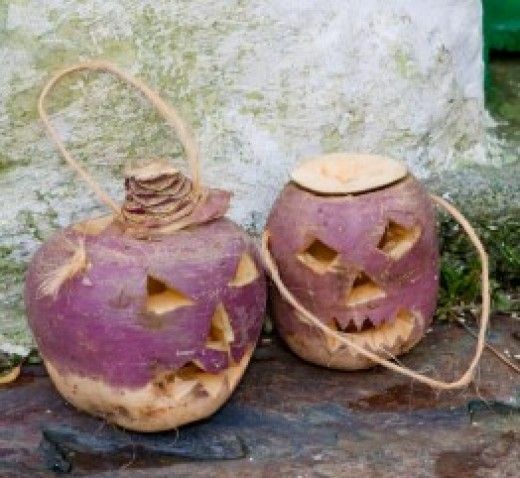 Irish and Scottish children carved faces out of huge turnips (left) and placed candles inside to help them find their way home as the went “guising” on Halloween night. In Colonial America, pumpkins were more abundant than turnips, so they were used instead … and thus began the American tradition of the jack-o’-lantern. 8. 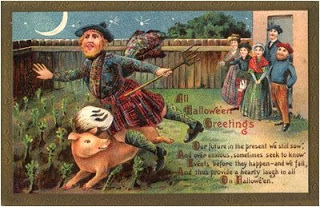 Halloween in Colonial America was a mix of the traditions of the European settlers and customs of the Native Americans. It was devoted to the celebration of the harvest among neighbors—more of a community get-together, a public event where neighbors shared ghost stories, told each other’s fortunes, danced, ate, and sang. 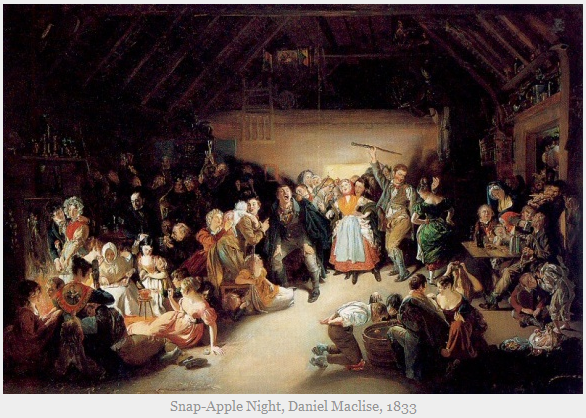 Irish painter and illustrator Daniel Maclise captured the essence of Halloween celebrations in his “Snap Apple Night” painting. 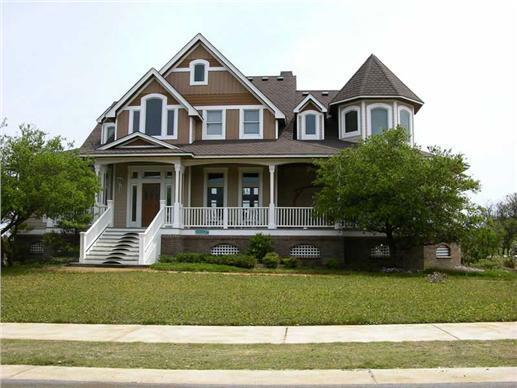 Celebrate your own Halloween costume party/community get-together in the attractive and spacious Great Room of a bucolic two-story, four-bedroom contemporary style home. 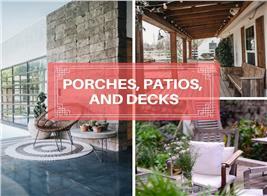 Take the party outdoors on the wraparound deck, and bask in the colorful sights of the fall season (Plan # 126-1250). As Halloween spread across the country in the late 1800s, Americans began dressing in costumes. Children visited neighborhood homes and shops, and they were rewarded with sweets and nuts for their songs and poems. Welcome to trick-or-treat American style! 9. By the late 1940s, trick-or-treat was a national phenomenon. In 1948, Ozzie and Harriet Nelson entertained trick-or-treaters in The Adventures of Ozzie and Harriet. In The Adventures of Ozzie and Harriet, the Nelsons opened their door to trick-or-treaters (left). 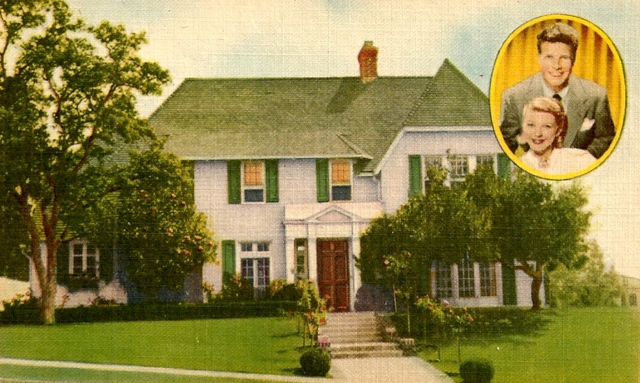 The television home was also the Nelsons real home; it is said to have been haunted by Ozzie Nelson until it was remodeled last year. At right is a view of the “new-look” home, which was used in HBO’s Entourage. With the right decor on the front door, porch, upstairs windows, and turret, this beautfiul two-story Victorian home can be turned into a “haunted house” for Halloween (Plan # 130-1054). All set for trick or treat! 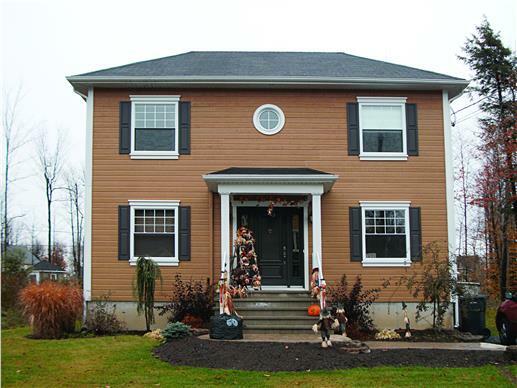 The front steps of this two-story European-Colonial style house are decked out for Halloween (Plan # 126-1341). 10. 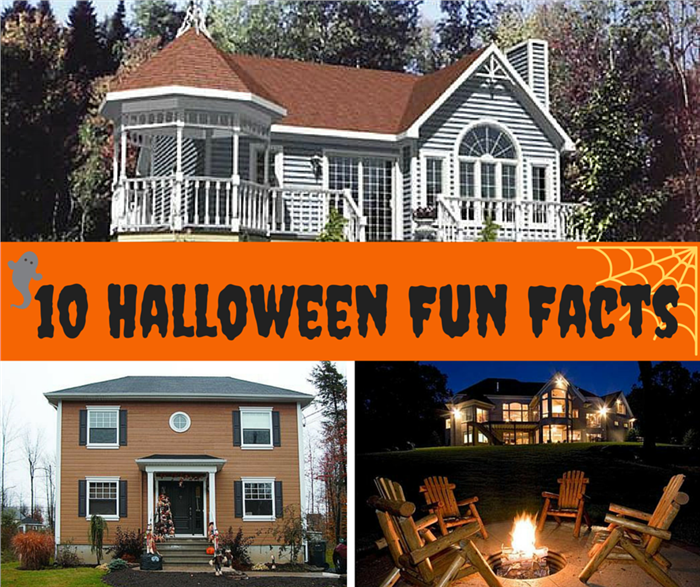 Finally, did you know that in 2014, Americans spent about $7.4 billion on Halloween costumes, decorations, and candy? For the past three years, candy spending has reached $2 billion and the National Confectioners Association expects that figure to be higher in the coming years. Now that you have been enlightened more about Halloween, get ready with your decor, treats, and surprises—and have a truly spooktacular celebration! 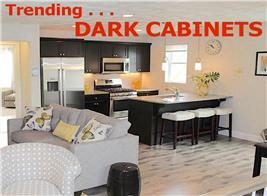 Footnote: The lead (top) image in this article is a beautiful one-story Victorian cottage built in a woodsy area. 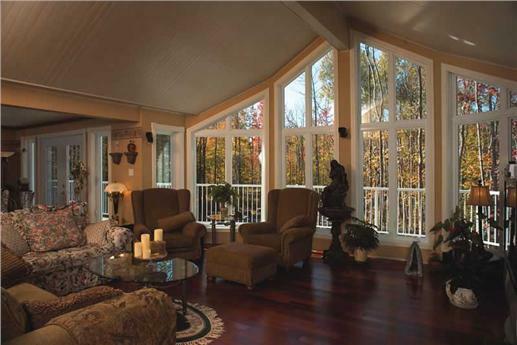 Its location, wraparound porch, and turret can provide Halloween enthusiasts with a lot of inspired decorating ideas. 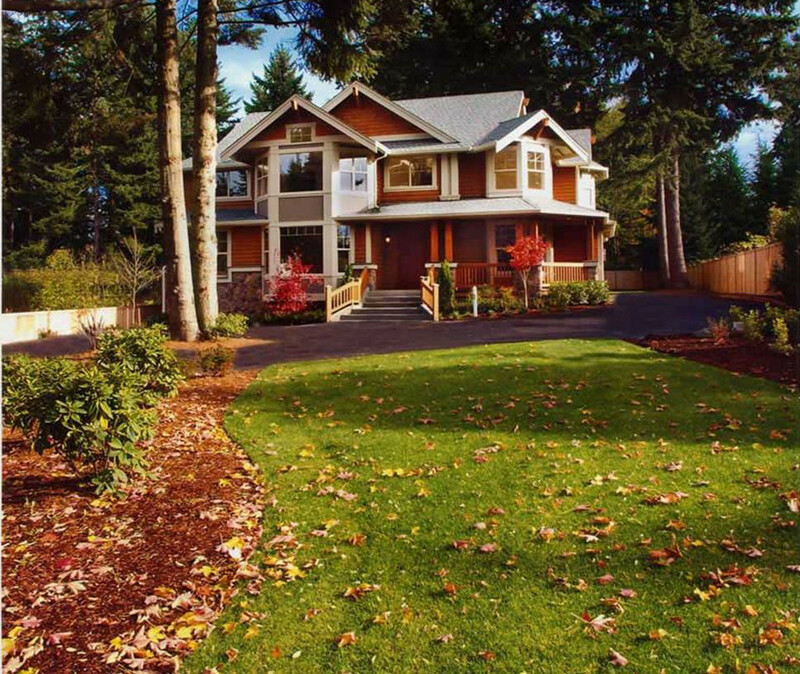 For more on this house plan, click here (Plan #158-1043).